Attend a 2 day class to make the Bionic Gear Bag. 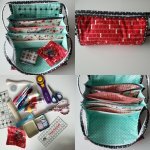 Class fee includes the pattern, instruction from Esther and Kayla, video support and a question and answer period with the pattern designer Sally Thompson, as well as 2 lunches, and snacks. Supplies are an additional cost and must be purchased at Chicken Feed Quilts.